The Pleasant Grove Cemetery is located in central Lauderdale County. This enumerator has been told that the cemetery may have been designated by other names as well. It may have been known in the past as “Old Baptist Cemetery” or “Crystal Springs Cemetery.” It is listed as Pleasant Grove on topographical maps. 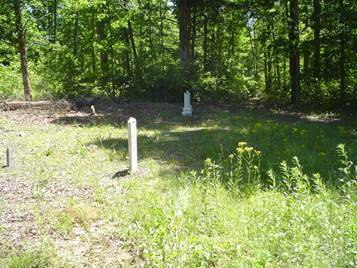 This cemetery has numerous graves either unmarked or marked with field stones. The oldest marked grave found is that of Sallie O. Owens, who was born in 1760. This cemetery encompasses an area of two to three acres. To reach the Pleasant Grove Cemetery, travel from St. Florian, Alabama on Co. Rd. 47 for 5.8 miles. Turn left onto Co. Rd. 73 & at intersection of Co. Rd. 73 & Co. Rd. 34, turn left and travel about .2 mile. The cemetery is on the left in a wooded area. An alternate route is to travel Co. Rd. 47 for 7.6 miles, turning left onto Co. Rd. 34 & travel 1.9 miles past Stutts Rd. Church to the cemetery on the left. Enumerated by David & Martha Montgomery on May 4, 2009. Owens, Sallie O.; b. 1760, d. 03 Apr 1863, wife of T.
The following is information is from a 2004 enumeration by Liz Moore & Judy (Myrick) Miller.